Some people run with headphones. I have considered it and chosen not to. I imagine listening to music while running can both help regulate your pace and maybe help you lose yourself in the moment, making the moment have a bit of a zen feel. I’m sure there is an argument about a lack of safety due to headphones but I suspect it is a bit overstated. I choose not to wear any headphones. I like the sounds that come with each run. I look forward to the bird song, the dog bark, the traffic noise, the ambulance siren, the sound of my feet hitting a puddle, the cadence of my breathing, and all the other sounds that come with the moment. I enjoy running as a time where I can truly live in the moment. For that little time window nothing else matters. I hit my own zen when I get to take in the cacophony of a city without it having any effect on me. It is probably more dangerous than if I listened to music, but I get to feel more a part of my world. I think accepting and living in the world as it is right now is key if I am to stand a chance at making any changes in it. Another great reason not to wear headphones is to listen and talk to Rebecca. 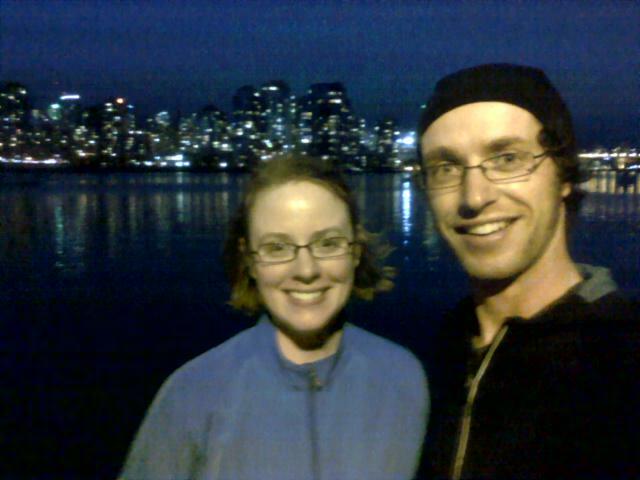 She came with me for a 5.9 km run with me tonight. I get you on the “zen” of running…..I find when I really get in the moment and hit my stride I don’t hear anything, I’m completely in the moment and I love it. I have experienced this with or without headphones and it’s what keeps me motivated…… however, on the days when I don’t hit my stride and the zen of running is a mere figment of some yogi’s imagination, I find the headphones do a great job at dulling the volume of the wheezing and gasping.